As you can see for flights in North America, to Europe and Central/Latin America Premium Economy on Air Canada sits right in between Economy and Business Class amounts while redemptions to Asia, Africa, Middle East tend to fall on the higher side as they are closer in cost to Business Class rewards than they are to economy class. One way flight rewards are of course, half these amounts. These routes are operated with a mix of 8 Boeing 787-8 and 7 Boeing 777-300ER. 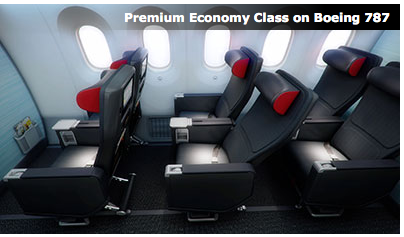 This provides an excellent option for those people who may be shy of getting enough miles to fly in Business Class but do have the right amount to get into Premium Economy. The redemptions for Europe do seem like a good deal and even Asia might be right for many of you although it would have been nice if they kept the pricing right down the middle just like Europe and the Americas. Of course the only issue that arises is the all too often mentioned Fuel Surcharges Carrier Surcharges and since these are for flights on AC most Aeroplan members will incur them except for Altitude SE100Ks.